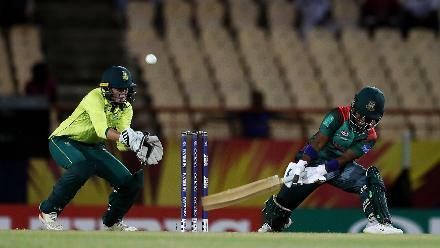 Fargana Hoque of Bangladesh is congratulate don catching Marizanne Kapp of South Africa during the ICC Women's World T20 2018 match between South Africa and Bangladesh at Darren Sammy Cricket Ground on November 18, 2018 in Gros Islet, Saint Lucia. 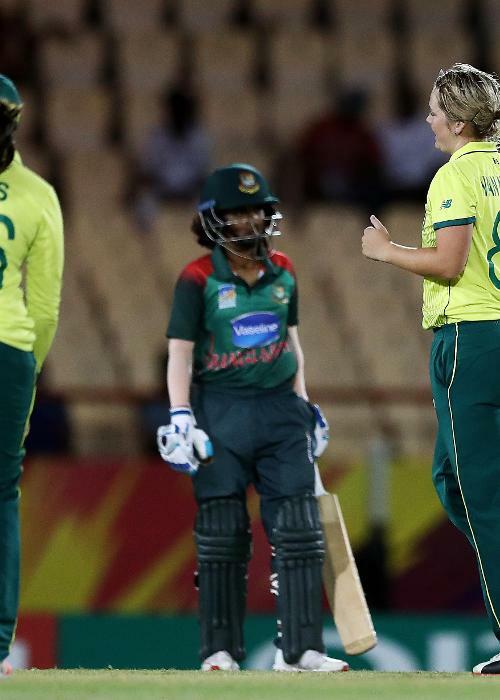 Sune Luus of South Africa congratulates Tumi Sekhukhune of South Africa on the wicket of Fargana Hoque of Bangladesh during the ICC Women's World T20 2018 match between South Africa and Bangladesh at Darren Sammy Cricket Ground on November 18, 2018. 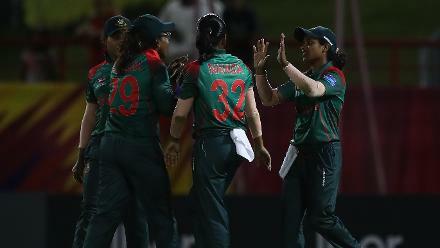 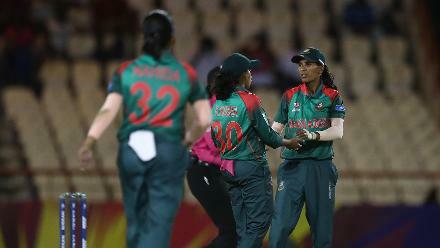 Salma Khatun of Bangladesh is congratulated on bowling Masabata Klaas of South Africa during the ICC Women's World T20 2018 match between South Africa and Bangladesh at Darren Sammy Cricket Ground on November 18, 2018 in Gros Islet, Saint Lucia. 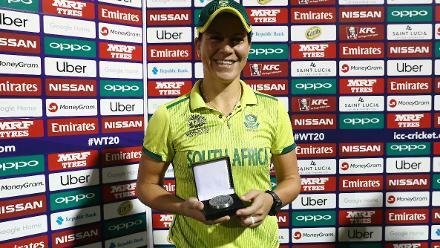 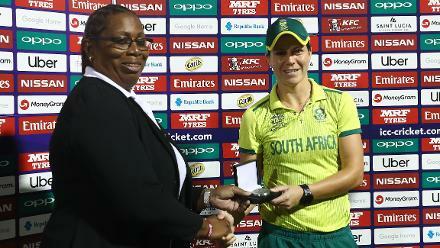 Nadine George, Former West Indies Captain, presents Marizanne Kapp of South Africa with the 'Player of the Match' award after the ICC Women's World T20 2018 match between South Africa and Bangladesh at Darren Sammy Cricket Ground on November 18, 2018. 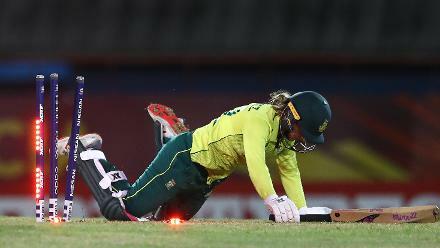 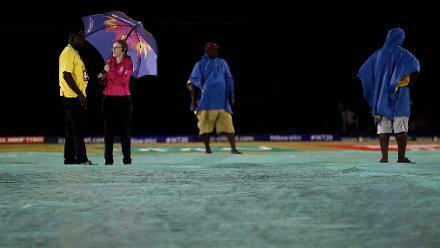 Mignon du Preez of South Africa looks on, after being run out by Nigar Sultana of Bangladesh during the ICC Women's World T20 2018 match between South Africa and Bangladesh at Darren Sammy Cricket Ground on November 18, 2018 in Gros Islet, Saint Lucia. 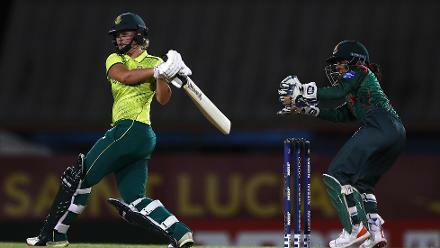 Dane van Niekerk of South Africa celebrates bowling Nigar Sultana of Bangladesh for LBW during the ICC Women's World T20 2018 match between South Africa and Bangladesh at Darren Sammy Cricket Ground on November 18, 2018 in Gros Islet, Saint Lucia. 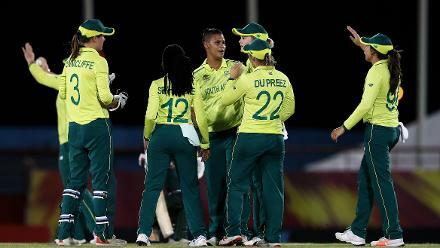 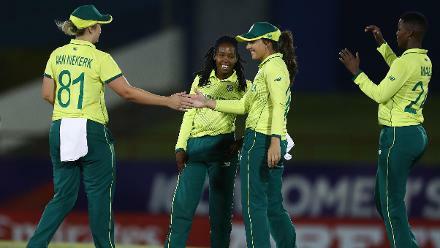 Moseline Daniels of South Africa is congratulated on bowling Ayasha Rahman of Bangladesh for LBW during the ICC Women's World T20 2018 match between South Africa and Bangladesh at Darren Sammy Cricket Ground on November 18, 2018. 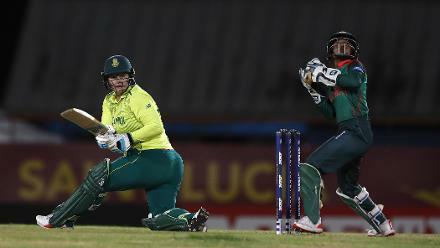 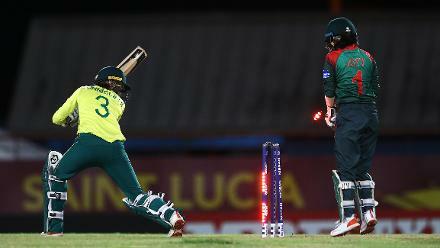 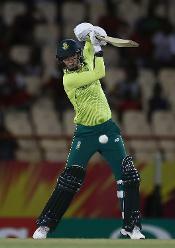 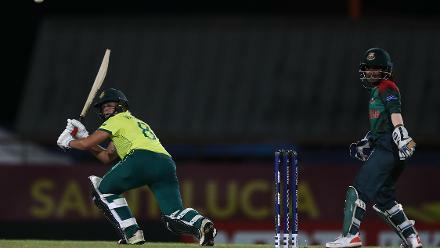 Marizanne Kapp of South Africa hits the ball towards the boundary during the ICC Women's World T20 2018 match between South Africa and Bangladesh at Darren Sammy Cricket Ground on November 18, 2018 in Gros Islet, Saint Lucia. 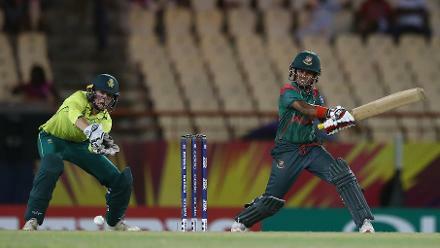 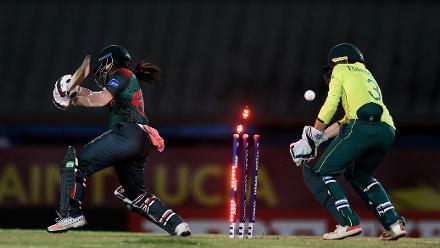 Fargana Hoque of Bangladesh hits the ball towards the boundary, as Faye Tunnicliffe of South Africa looks on during the ICC Women's World T20 2018 match between South Africa and Bangladesh at Darren Sammy Cricket Ground on November 18, 2018.